My maternal grandfather Albert (Bert) Underwood was a tall, gentle man with ginger hair in his younger days and a large nose (the Underwood nose) which I inherited together with his love of gardening. Bert was born in the Leicestershire village of Billesdon in 1885, the son of Robert Underwood who was coachman for the local doctor. He was one of three brothers all destined to serve in the Great War. The eldest brother Frank was an officer, Jack was a corporal, and Bert became a sergeant. All three survived, and the more I find out about their service and the war itself the more miraculous this seems. As a child I was aware that my granddad had fought in the First World War, but like most children I thought little of it. The subject rarely came up but he didn’t fall into the ‘never spoke about it’ category. I have memories of his recollections during Sunday teas: for example saying he was wounded (before the Somme?) after being sent out to repair trenches in daylight by a new ‘green’ officer, and having seen dead Scottish soldiers in kilts looking ‘like flowers’. These are the vague memories of a child at boring teatimes and perhaps distorted by memory and my own age. These are the ‘relics’ from 1914-18 which I hope will be of use to you. I’m sorry it took so long to sort out but it seems people were great senders of postcards in those days (of few telephones) under ½ penny green stamps many of which were no use. Frank was an officer because they could only afford to educate the eldest in those days. Jack was a corporal. Dad was a sergeant. The White Hall, Billesdon (on postcards) was the home of the village doctor whom my grandfather, Robert Underwood, used to drive around the county in a carriage and 2 horses to his patients. Dr Williams gave Grandad his cottage early in the century. ‘M’ or ‘Mabs’ was Auntie Mabel, who married Uncle Jack. She was a parlour-maid at the White Hall. Uncle Jack drove a big lorry in France, but horses were also used a lot and soldiers marched long distances. All three brothers were wounded several times and sent back to England. Mercifully all three survived. While in hospital they all wore ‘hospital blues’ a blue uniform. Dad mentioned Salisbury Plain, Rugely Camp and having to line up to ‘gargle’ during the very bad ‘flu epidemic which killed thousands. I think the cartoon postcards are very interesting as a sidelight. They mention puttees, which Dad had to wear, also duck-boards which acted as bridges across seas of mud. Zeppelins were airships which dropped bombs – not so many aeroplanes then. Mustard gas was used by the Germans. Dad was gassed and blind for a fortnight. The gas lay in shell-holes – very nasty. Patriotism was very high. Dad said the officers were ‘the bravest of the brave’, but apparently the ‘Sam Brown’ leather belts which officers wore were a target for Germans. They kept up their courage by singing. I remember Uncle Frank said that a friend of his was shaving out of doors and used to sing “The flowers that bloom in the spring tra-la, have nothing to do with the war”, but then everyone used to sing a lot in my childhood. I do hope that I haven’t depressed you too much and that the enclosed will be useful – your Great-grandfather’s generation, over 80 years ago. I was always aware of a collection of WW1 memorabilia owned by my mother, and when we cleared the house after my parents’ death I found it at the back of a drawer organised by her unique filing system of ancient polythene bags and decaying rubber bands. I already knew about three items which had been brought out occasionally and had fascinated me since childhood. The first is a photograph of gardeners at Noseley Hall in Leicestershire apparently just before the war, with Bert a garden boy (on the right of the picture) unaware of how his world was about to change. 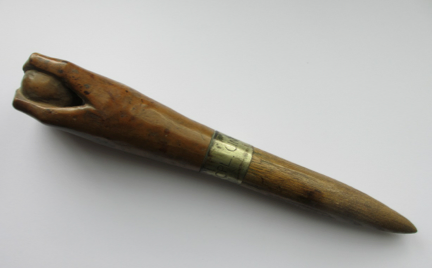 The second is a wooden gardener’s dibber made as trench art and bearing a brass band engraved CPL UNDERWOOD. 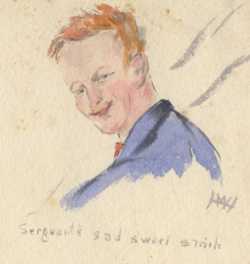 The third is an evocative watercolour sketch of a shy ginger lad labelled Sergeant’s sad sweet smile. I did nothing with the material beyond removing the rubber bands, and although the medals, letters, photographs and documents were fascinating, research was put off for another day. 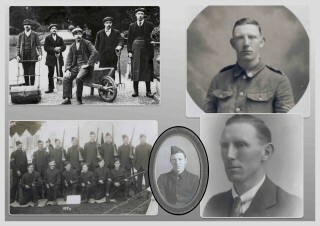 The stimulus I needed came from David Middleton and members of the Bottesford WW1 Centenary Project who made my wife Sue and I very welcome as a new village residents, and kick-started me into researching Bert’s war service. To: Sgt A. Underwood, 9/1501, B Coy 8th Platoon, 9th Batt. Lei Reg., B.E.F. Thanks very much for your letter. Allow me to congratulate you on your promotion, for my own part I think I should be like the Irishman, rather have a ral at the end of my title. Then they could not tell whether you were a general or a corporal. Joking apart I was very pleased indeed to hear that you are getting on so well, I often think of you and the hard life you must be having, now the nights are getting so long and cold, it would be a great blessing if the war would soon end. I had T. Belton call last Friday week. He was looking the picture of health, as he soon got over his little puncture, was full of the exploits he had done. 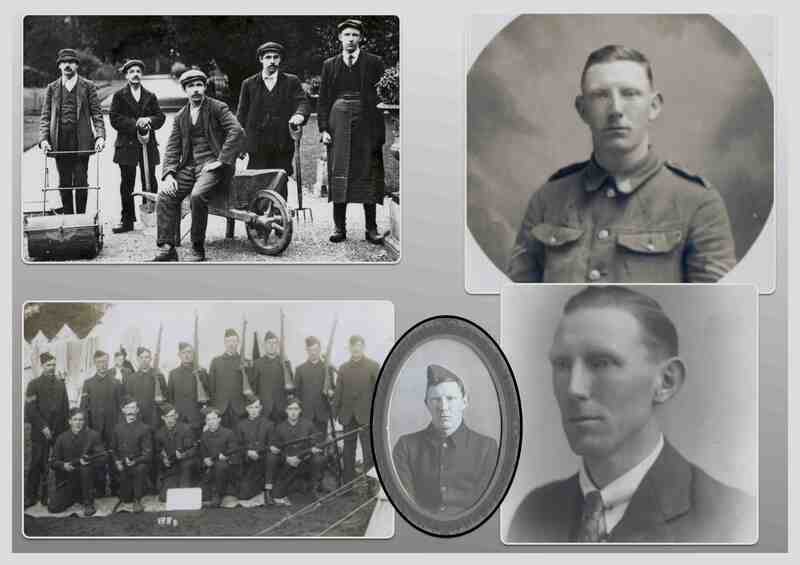 Reckoned he settled 10 of the Fritzes himself, shot well that morning he said, he was off to Shropshire on the following Monday to rejoin the reserves ….… he will soon be at the front again. I have had a letter from poor old Sauby(? ), he must have suffered terribly with the ecrews(? ), but seems pretty cheerful on the whole. We had our Harvest thanksgiving on the 31st of October, late again I never saw the Chapel look much better, though we had very few Mums to take in this time as they too were later this season. There were no Dahlias for the windows either, as the early frosts had settled ….. as we used bunches of herbaceous stuff and it made quite a nice change, it turned out a pouring wet morning which was a bad job as about 30 of the local German frighteners, I call them, I forget their proper title, but I believe it is Citizens something turned up. Old Doughty(?) the butcher was in the front rank as they marched down the drive. Chucking his chest out like a Pouter pigeon. Clark and S….. were there too, quite a martial looking crowd. We had Sir at home for a couple of days last week as they had a shoot on Thursday, killed 63 pheasants, which was not so bad considering they had done no rearing. If Tommy had been there with his rifle he would have done better than some of them, by the account I got of the shooting. Have not heard much of the hounds lately, they were not able to hunt to-day, as the ground was too hard. I would think there was quite 16 (degrees) of frost last night (Sunday). Winter seems to have set in early, but very likely we shall not get any more until the turn of the year, one thing it has done good is fetching the leaves off. The Mums are rather patchy this time, some rather good and others “just middling like” as the old chap said. Hoping you are still keeping fit, pleased to say we are all well, wishing you the best of luck. The letter is dated November 1915 and congratulates Bert on becoming a sergeant, so the wooden dibber inscribed CPL UNDERWOOD must pre-date this. Despite his missing war record the war diaries of many regiments are available from the National Archives, and for a ridiculously small online fee I found myself reading the day-by-day hand written account of the 9th Leicestershire Battalion’s war. This was enough to establish the locations and battles that Bert may have experienced, and the enormity of what he must have endured began to emerge during visits by Sue and me to Flanders in 2013 and the Somme area in 2014. To take just one example, the war diary and book show that early in 1915 the 9th Leicesters were in the tiny French village of Bienvillers, facing the Germans in trenches close to their stronghold in the next village of Monchy. Today Bienvillers is a peaceful village (with several large dogs), and the book suggests that in the early days of the war soldiers found the area an idyllic base, probably more exotic than Bert’s home village in Leicestershire. However the Commonwealth War Graves Cemetery at Bienvillers hints at the truth. The very back row of graves against the rear wall consists almost entirely of Leicestershire Regiment casualties from 1915 killed during those supposedly quiet days, and the hundreds of others that stretch forward in space and time towards the front of the cemetery show what was to come as the war progressed. Amongst the artefacts I inherited is a number of photographic postcards of Bienvillers, so I do believe that Bert was there and this is reinforced by his promotion to Sergeant in November 1915 when the 9th Leicesters were in the area. However I sometimes wonder how he survived the entire war, and whether his wounds and spells of recovery in ‘Blighty’ meant that he escaped death by missing key engagements. A tantalising prospect is that his medical records may have survived. Apparently after the war most medical and hospital records were destroyed and just a representative selection remain at the National Archives: no more than 2% of the total. However these include individual medical records for the officers and men of just five units including the Leicestershire Regiment. There are many thousands of records for each unit, and a thorough search of a single unit might take a day or two at least. A project for my retirement! A second surviving letter transcribed below is a character reference for Bert that shows he spent time at Rugeley Camp (on Cannock Chase) in 1916-17. Jonathan D’Hooghe surmises that if Albert had been wounded before this date he was convalescing and acting as a training sergeant to young soldiers until he was well enough to return to the front line. In the letter Jonathan’s best hunch is that STRB stands for Special Training Reserve Battalions or something similar. Serg. Underwood S.T.R.B specially employed under me at the Trent(?) P…. ???? in Rugely Camp during the whole time I was in charge from its opening in Nov. 1916 until I left there early in May 1917. He was most helpful in matters of organisation ………………. the daily issue to the troops in a thoroughly satisfactory manner; and in this his previous practical knowledge of the business was valuable. In charge of the working party he showed good tact and judgement. I found him an indefatigable worker himself and felt I could rely on his sensible cooperation at all times to carry out my instructions. I know that Bert left his Leicestershire village to join Kitchener’s Army as part of the 9th Leicestershire Battalion, served in France and Belgium throughout the war, spent time back in England recovering from wounds on several occasions, and was discharged in 1918 as a member of the 7th Battalion which subsumed part of the disbanded 9th Leicesters in February 1918. From the war diaries and a map it is possible to trace his possible progress through the horrors of 1915-18, although I have only just started to piece this together. A list at the end of this document shows just some events that Bert may have experienced. In 1918 Bert returned to England via Harrowby Camp near Grantham, and a number of his discharge documents survive. 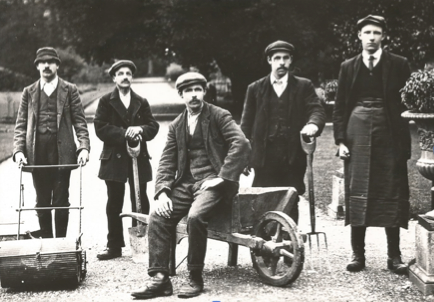 He returned to his life as a gardener in Leicestershire, and in 1921/2 married my grandmother Annie. Their three daughters grew up in Albert and Annie’s small cottage in Bushby, Leicestershire, and a final mystery is provided by the name of that cottage: Beaumont Hamel. Sue and I visited the area near Beaumont Hamel in our trip to the Somme, including the truly moving Newfoundland Park where front line trenches survive as a memorial to the slaughter of soldiers from the Newfoundland Regiment and many others. So far I have found no suggestion that the 9th or 7th Leicesters fought at Beaumont Hamel so the cottage’s name remains a mystery. Bert died in 1981 when we were expecting our daughter Liz, so great grandfather and great granddaughter never met. I just wish that I could invite him to Sunday tea just once more and ask him a few questions, before showing him our new garden in Bottesford. 28 August 1915 Address by commander at HQ saying German infantry demoralised & tired of the war. 29 August 1915 Large number of cases of scabies discovered in battalion, due largely to lack of water in the neighbourhood. All treated with cresol & formaldehyde + dry in sun 27 cases to field ambulance. 12 September 1915 Party of 300 men worked in trenches by night. 14 September 1915 150 men buried wires to Brigade HQ at POMMIER. 9 pm message that French on left of 110th Brigade expected German attack. Ordered that A & B Coys should reinforce 7th LR if attacked. 15 September 1915 No attack, 1 man killed by bullet. 17 September 1915 BIENVILLERS Day spent cleaning up part of town occupied by 9th Battalion. At 7:30pm started from BIENVILLERS to relieve 7th Reg in trenches. 23 September 1915 Gaps cut by 9:30pm despite bright moonlight. I MAN BADLY HIT IN FOOT BY SHRAPNEL. 11:40 pm Lt HM Henwood accidentally shot himself in leg. 25 September 1915 Orders to be ready for a general advance at short notice. 10 December 1915 Very little activity due to deplorable state of trenches. Forced to go into open but rarely shot at. 30 June 1916 SOUASTRE Battalion received orders to move at 6.15 am on 1st July to SOUASTRE as VIIth Corps Reserve for the Offensive. 09 July 1916 The Divisional Commander addressed all officers on the coming offensive. 11 July 1916 Heavy shelling all 11th but no infantry attack. 14 July 1916 Batt. Moved off at 12.15 am to s. edge of MAMETE WOOD. 500 yds w. of front edge at 3.20 am just as intense bombardment of German trenches began. AT 5.20 AM B COY (CAPT ANDERSON) & 1 platoon of A moved over to BAZENTIN – LE – PETET Wood to reinforce the 6th Batallion. They finally reached N. of wood. of village and as far as possible dug themselves in. They were mixed up with 6th, 7th & 8th Bns. Heavy casualties including ALL COY OFFICERS. 8. 15 am LT COL. HAIG with D & 1/2 of C Coy moved to BAZENTIN-LE PETIT WOOD. 12 noon Col Kumme, 2 Offs & 30 m3n captured by D Coy. 4 – 7pm attack on NW edge of wood killed 4 German observers & attempted to charge German trenches 50 yds from edge of wood. CAPTAIN EMMET & 36 MEN KILLED BY MACHINE GUN FIRE. 15 July 1916 MAMETE WOOD 2 AM Batt. Ordered to go back to centre of MAMETE WOOD by 8 am, then ordered back. 16 July 1916 BAZENTIN – LE PETIT VILLAGE Capt. Bent with D & B COYS went to BAZENTIN – LE PETIT VILLAGE to relieve …..
24 September 1916 GEUDECOURT ASSEMBLY TRENCHES Marched to assembly trenches in front of GUEDECOURT. ATTACK to be carried out in eight waves B COY IN RESERVE. ‘Enemy completely smashed & Goat Trench lightly held’. 25 September 1916 Waves formed up in front of trenches. A & B COYS in artillery formation, enemy immediately commenced an extremely intense & deep barrage. 1 pm A & B Coys advanced & established themselves in NEW TRENCH, BULL TRENCH & PATROL TRENCH. Battn HQ moved to Patrol Trench, then Bull trench, then New Trench. 3 pm bombing group of 8th & 9th organised & bombed down GIRD TRENCH on right of PILGRIM’S WAY for 50 – 60 yards. Many enemy killed or taken prisoner. November 1916 – May 1917 Rugeley Camp Letter suggests Bert was at Rugeley Camp during this period. 11 February 1918 A draft of 11 officers and 240 men joined the (7th) Battalion from the 9th Battalion LEICESTERSHIRE REGT. A fourth platoon for was organised from these men. 21 March 1918 At 4.30am the enemy put down a heavy barrage gas shell bombardment of phosgene and mustard gas ….this gradually developed into heavy concentration of HE and shrapnel on the whole of our defences. The bombardment lasted till about 9.30am. Most of the wire in front of our division front line was destroyed. About 9.30am the enemy entered PLANE TRENCH and 2nd Lt Fairey(?) who was o/c of the observation party left in that trench had only just time to give the S.O.S signal before the enemy reached him. The enemy had apparently broken through the front line of the Bn on the left and at this hour small parties attacked the northern post (McPHEE) in PEIZIERE and got into the railway cutting behind the RED LINE. The detached position of McPHEE POST was captured and about 6 men taken prisoner. At 10am C Coy and the tanks were ordered to counter attack and clear PEIZIERE up to the railway cutting. The tanks proceeded around the northernend of the village ….The village was easily cleared. This page was added on 25/01/2016.